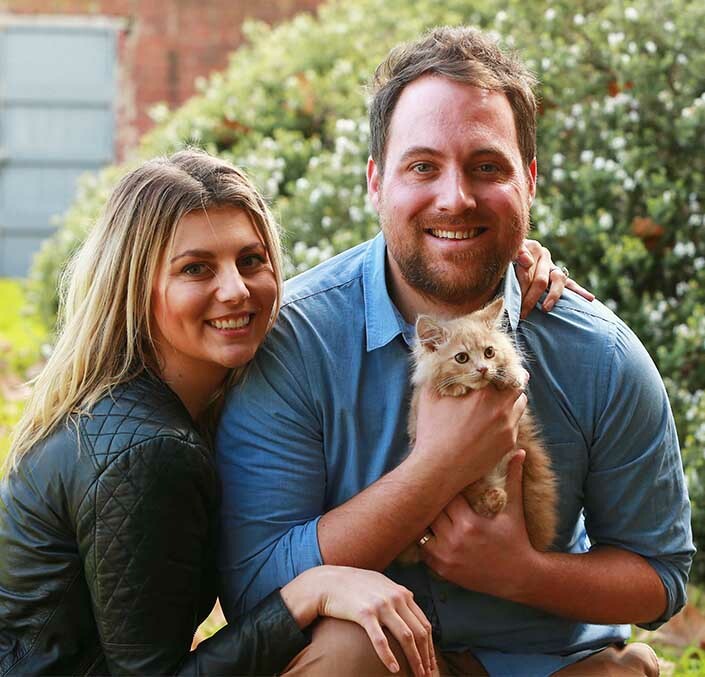 Burnley, the miracle kitten who was rescued from the Burnley Tunnel last month, has today set off on his new life. 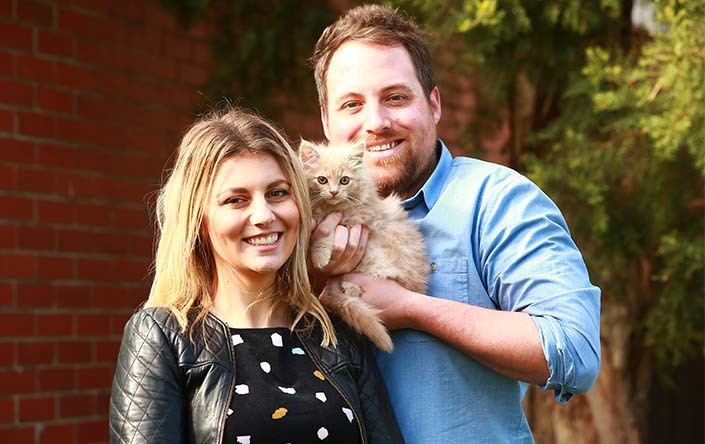 Cat lovers Amanda and Hayden were among the 113 people who registered their interest in adopting Burnley after seeing his incredible tale of survival on 7 News. When they received a call from the Home to let them know they had been successful, they couldn’t believe it. We felt very fortunate, because we know there would have been so many other great applicants. But we do promise to bring Burnley home to a house with lots of love and cuddles. We’re thrilled,” said Amanda. “We’ve just moved into our first house on Burnley Street. We were sitting on the couch watching TV. We’d actually been discussing getting a new pet, when the 7 News story came on and we saw Burnley, this little cat in the tunnel. We thought, ‘It’s meant to be – he’s got to be the one’,” said Hayden. “He’s had a lot of care and attention. He’s very lucky to be rescued from the tunnel – we don’t know how he survived. Ironically, Burnley will travel through the Burnley Tunnel on the way to his new home. This time though, he’ll do it from the safety of the family car. 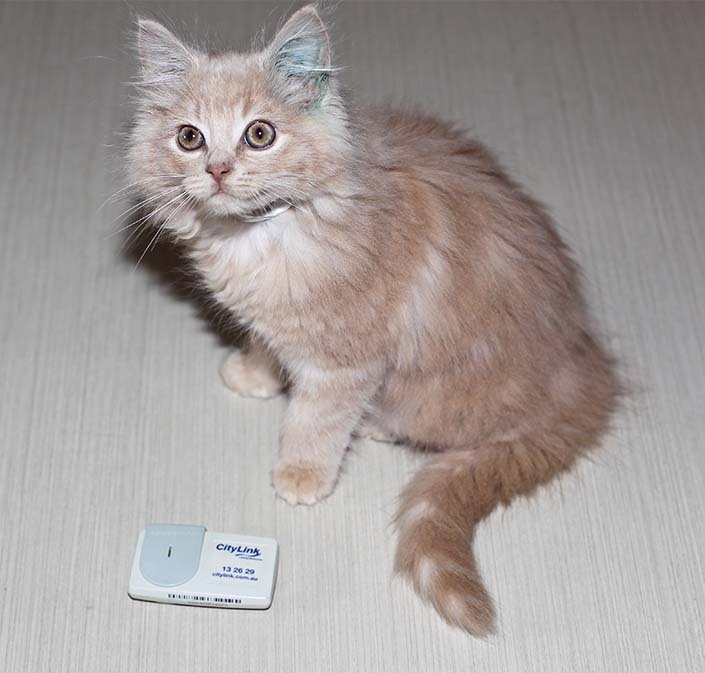 “We’ll make sure he’s wearing an e-TAG from now on. He has to pay his way,” said Hayden. Proud pet adoption advocates, Hayden and Amanda hope their story will encourage other people to adopt their next pet from a shelter. These animals are absolutely beautiful. They just need a loving home. We’ve had lots of friends adopt from The Lost Dogs’ Home and every one of them is a success story. There are plenty of cats here who need a home,” said Hayden. “They’re all so beautiful and so deserving of a wonderful home,” said Amanda. As Burnley begins his new life, his shelter mates are still patiently waiting for someone special to come along and choose them. 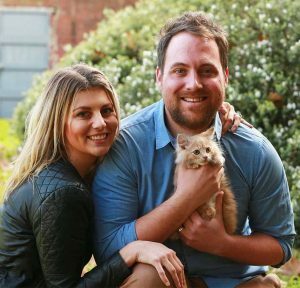 “We were touched that so many people were willing to open their homes and hearts to this very deserving kitten,” said the Home’s cattery coordinator, Amanda. “We’re so pleased that Burnley has found a lovely new family that will give him the lifetime of love and care he deserves. Can you offer a loving forever home to one of our cats or kittens? Click here to view our adoption candidates and find your new best friend.